We’ve all been warned that sun exposure can cause skin cancer, but that’s only half the story. The fact is that skin cancer was very rare 100 years ago and is still extremely rare among many populations who spend all day in the sun. Statistically the greatest rise in skin cancer has been in countries where chemical sunscreens have been heavily promoted. There is almost no skin cancer among dark skinned people living in Africa. That’s probably not solely due to skin pigment however because African- Americans have a higher rate of skin cancer and stay in the sun less than their counterparts living in Africa. It seems likely that the recent rise in skin cancers is due to factors other just sun exposure. Drs. Cedric and Frank Garland of the University of California believe that increased use of chemical sunscreens is the primary cause of the skin cancer epidemic. Dr. Marianne Berwick epidemiologist of Sloan Kettering Cancer institute concluded after years of study that: “we don’t really know if sunscreens prevent skin cancer at all”. However, everyone needs to know that there are safe alternatives. The problem with chemical sunscreens is this: for decades the mainstream media and cosmetic companies have strongly advocated liberal application of chemical sunscreens before any exposure to sunlight, even for young children. This is despite that there has never been adequate safety testing of the primary chemicals in these products. The possible link between sunscreens and skin cancer needs immediate in-depth analysis. 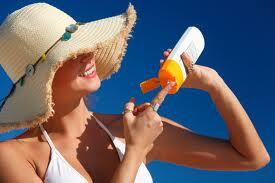 Many popular chemical sunscreens may actually increase cancer rates. 40% of sunscreens contain topical vitamin A, often listed as retinyl palmitate. Recent government studies have shown that tumors and lesions develop 21% faster when skin coated with vitamin A is exposed to sunlight. Wear clothes. Shirts, hats, shorts and pants shield your skin from the sun’s UV rays – and don’t coat your skin with goop. Early in the season a long-sleeved shirt is a good start. Don’t get burned. Red, sore, blistered (then peeling) skin is a clear sign you’ve gotten far too much sun. Repeated sunburn increases skin cancer risk. Once the skin turns pink the health benefits of vitamin D production cease. When choosing sunscreens you’d be smart to completely avoid those with vitamin A, (retinol or retinyl palmitate) and oxybenzone. Far safer active ingredients are zinc oxide or titanium dioxide. Inactive nourishing ingredients could include coconut oil, jojoba oil, vitamins D and E, sunflower oil, or shea butter. Choose a sunscreen effective against UVA and UVB radiation. I’ve found that one formula from a given manufacturer may be safe while another from the same company has dangerous ingredients. Do your homework or shop at a store that does it for you, then go out for some warm weather fun in the sun. Rob Pell owns and operates Sunshine Natural Foods in Grants Pass, Oregon and has 35 years experience helping people with natural foods, products, exercise and healing. This article was published in The Daily Courier 5-25 -2011.